Q: I am the owner of a 1985 Cal 22 sailboat that is moored during the season in Lake Tahoe, Nevada. 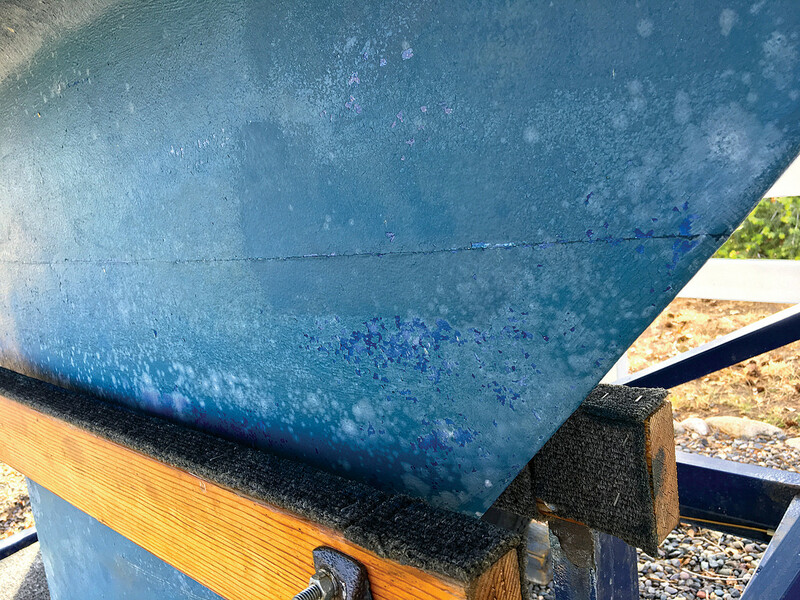 The boat is in very good condition; however, when I pulled it out of the water at the end of the season in early October this year I noticed a slight crack in the keel that extends around the entire keel, about one third down from the hull. A friend looked at this condition and called it the “Catalina Smile,” explaining the crack occurs on older boats where the hull meets the bolted on keel. I am wondering if this condition requires immediate repair, and if so, what type of repairs are needed. Your friend is right, although Catalina has no special claim to keel smile. Well, maybe some claim because the company unwisely used plywood in its keel stubs up until around 1987 or 1988, which has tended to make the “Catalina smile” somewhat broader than some others. The crack exhibited in your photo is more or less normal for a 30-year-old boat with a bolt-on keel. Plastic boats flex; metal keels don’t. I doubt that your smile requires any action, but before you repaint the bottom, you would not be wrong to reef out the crack a bit with a wire brush and give it three or four coats of an epoxy primer (Interlux Epoxy Primecote or something similar). If you still have a gap, fill it with a troweled application of polyurethane sealant, like 3M 5200, and then let the sealant cure for a week before painting. Moving forward, just watch the area every year. If the smile doesn’t return, or even if it does but not any wider, deal with it cosmetically. However, if it shows any signs of widening, you may need to re-torque the keel bolts. The definitive repair is to drop the keel, check the bolts, perfect the mating surface and reattach on a fresh sealant bed. However, the current condition of your boat doesn’t suggest anything this drastic.